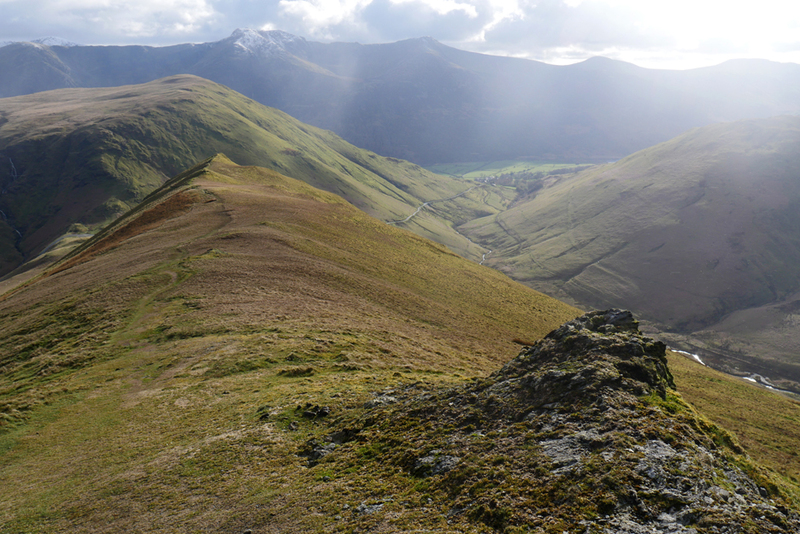 " Knott Rigg and Ard Crags "
Date & start time: Tuesday 2nd April, 2019. 2.30 pm start. 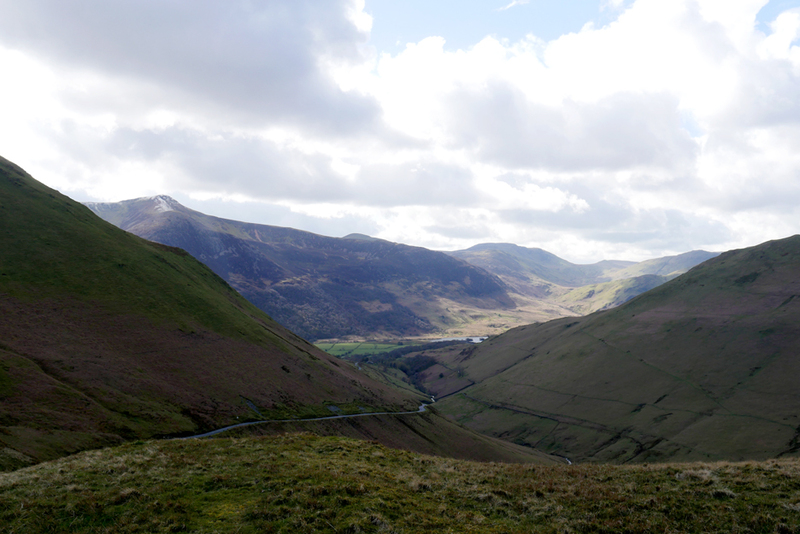 Places visited : Knott Rigg , Ard Crags and back to Newlands Pass. 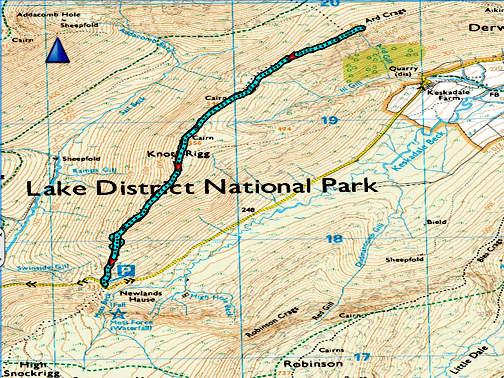 Walk details : 3.8 miles, 1300 feet of ascent, 2 hours 30 mins. Weather : A very changeable day with blustery wintery showers and sunny spells. with "Sunshine and April Showers" but those showers were sometimes more wintery than expected.
. . . well the top end of the valley has appeared out of the white misting of a heavy shower. 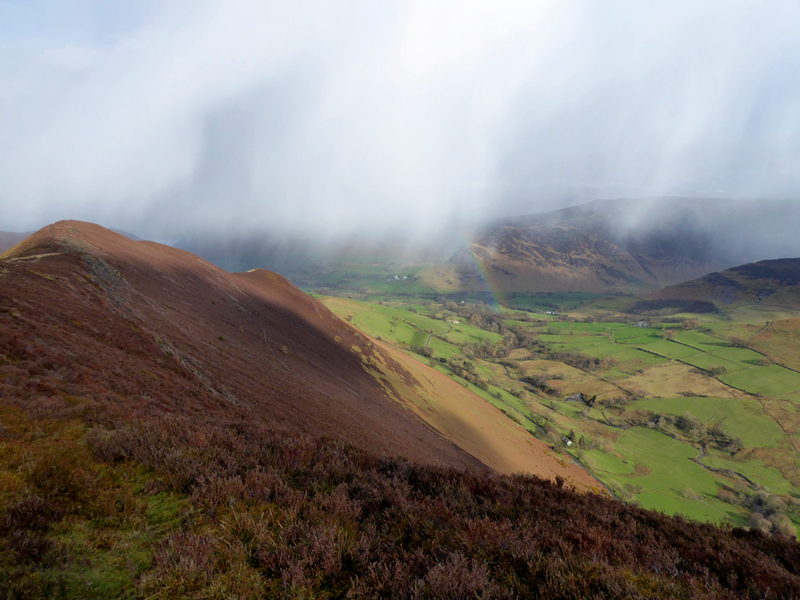 When it cleared the sunshine returned in force, but the tops of the high fells had just a little more white covering than they did before. 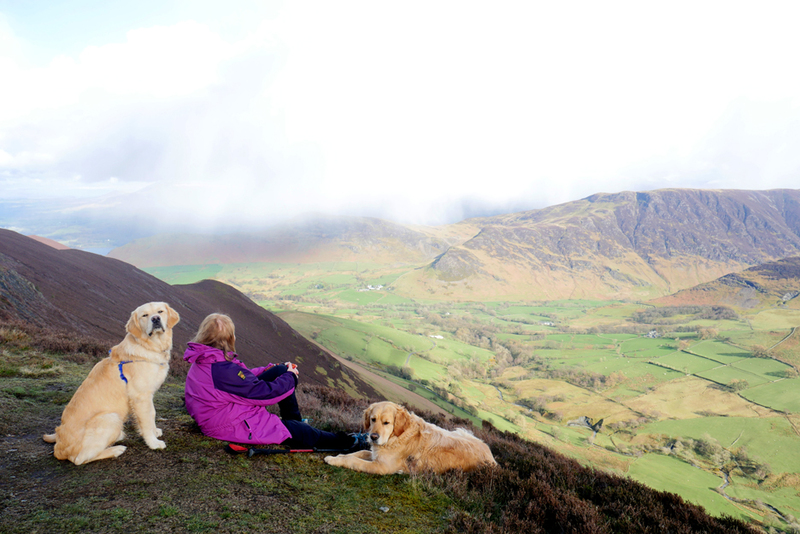 Today we're aiming for a ridge walk of Knott Rigg and Ard Crags. whose passengers stepped out and walked away leaving the door of the bus open . . . it would have been a better advert with it closed ! 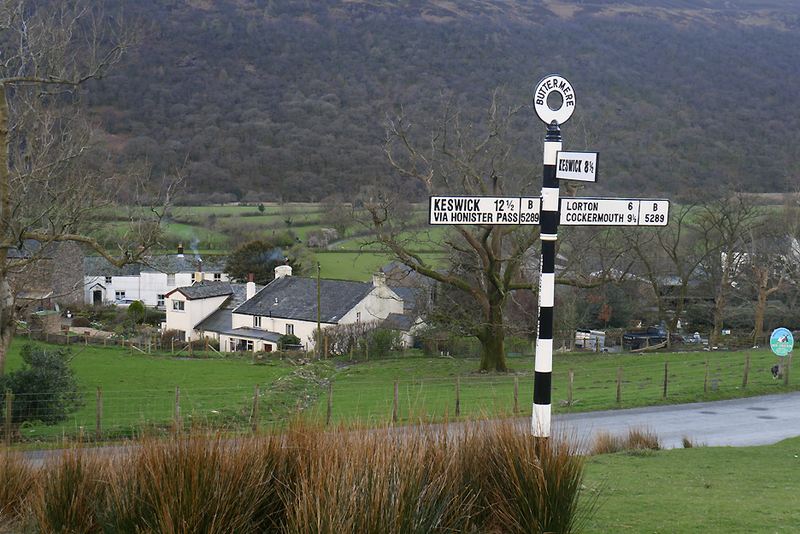 and diversified into tourist tours in and around the Lakes. and head up the slope toward the ridge. 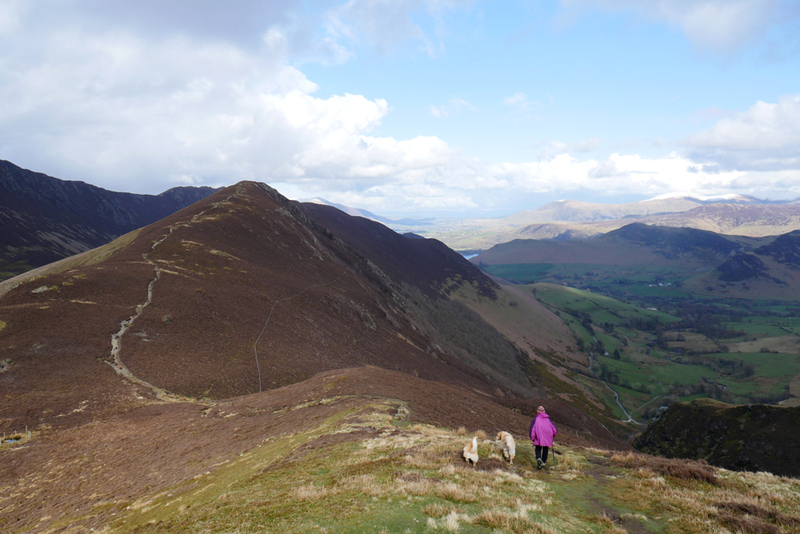 of Robinson on one side and the Grasmoor group on the other. it will not let us down. 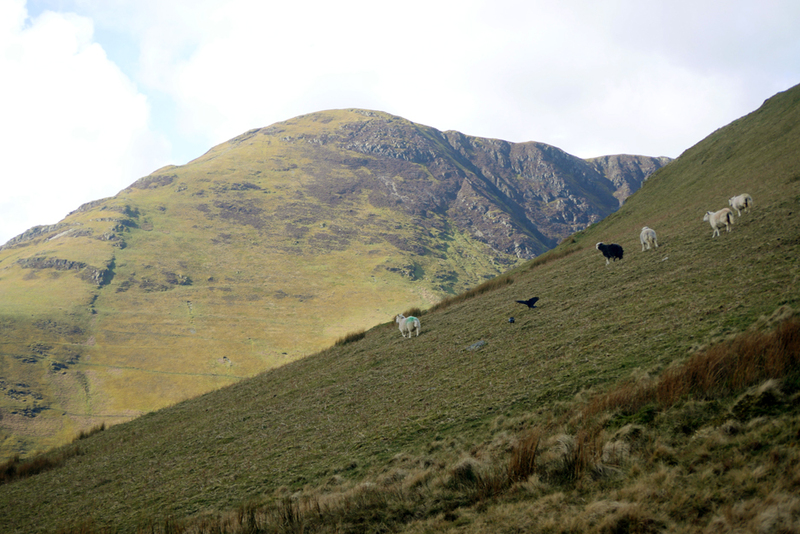 A black crow lands just as the local sheep take off across the steep fell side. The last part of the climb resembles the shape of one of your old school maths set squares . . . the 45 degree one. That makes it a "1 in 1" climb . . . I know which sounds steeper. as the path begins to level off. We are nearing the top of the first part of the climb. 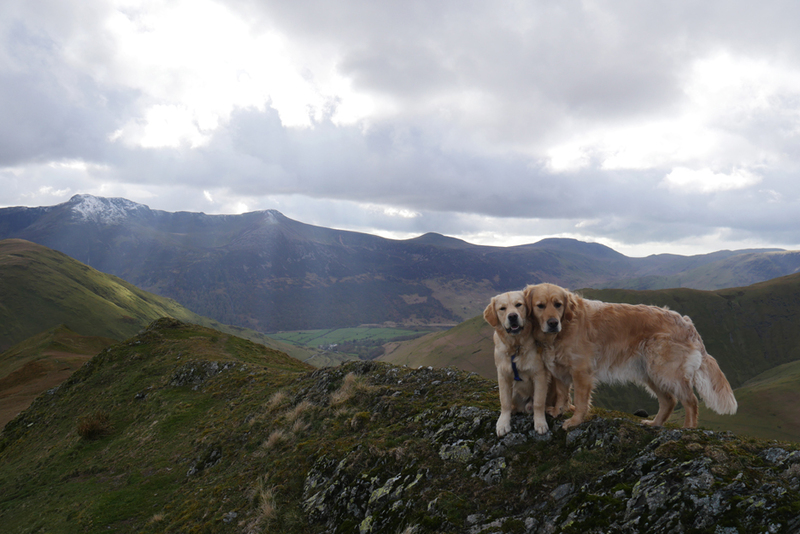 of the wintery weather of mid-March on the fells behind. not to be on the lead. with Ann in the foreground and Pillar in the far distance. As we climb onto the ridge we are sufficiently elevated to see a few more high summits. 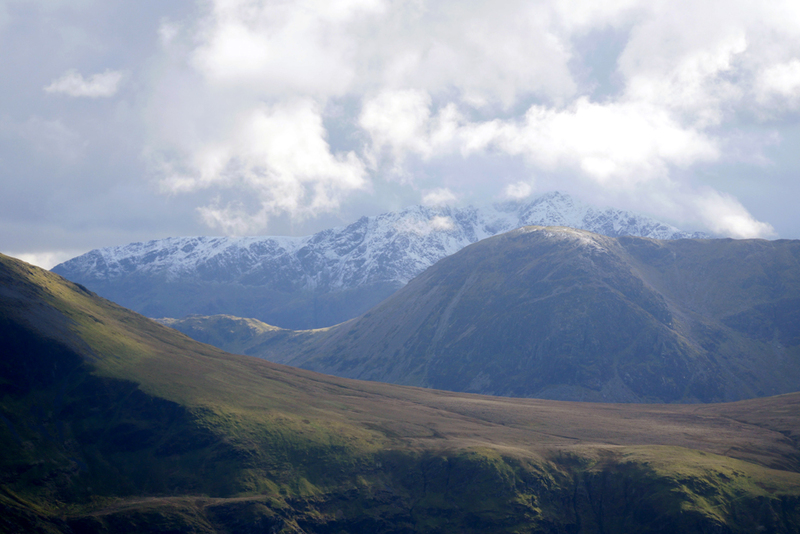 I think, though I can't be certain yet, that the distant snow is sitting on the Scafells. 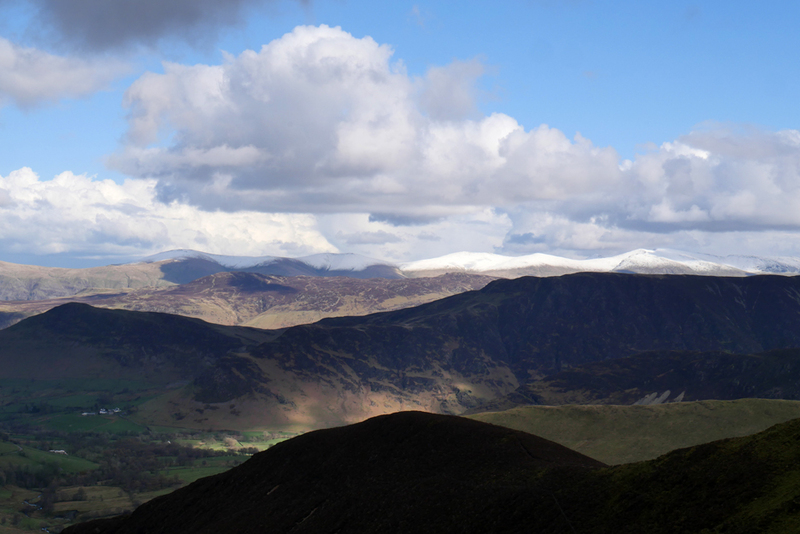 Further round to the left is the snow on Great Dodd, part of the distant Helvellyn ridge. 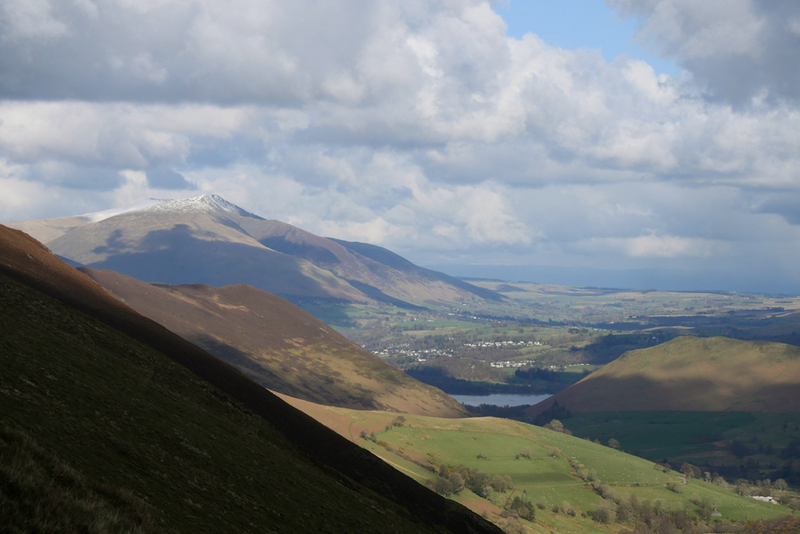 The view also opens up to reveal Keswick and a brief, first glimpse of Derwent Water. 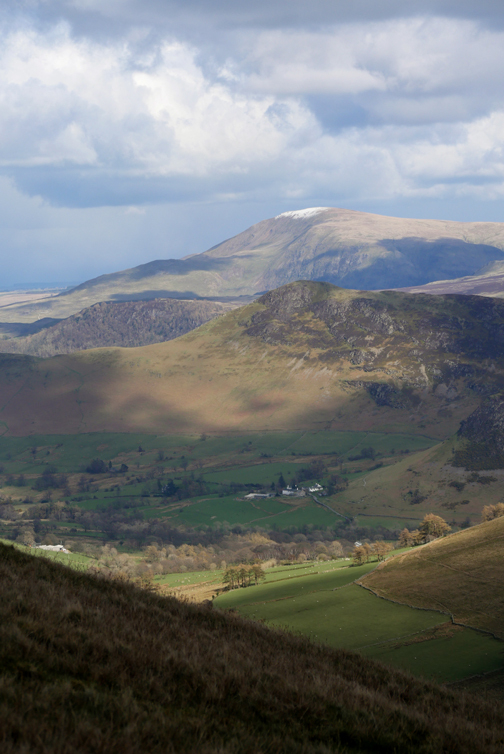 The snow to the left sits on the top of Blencathra. 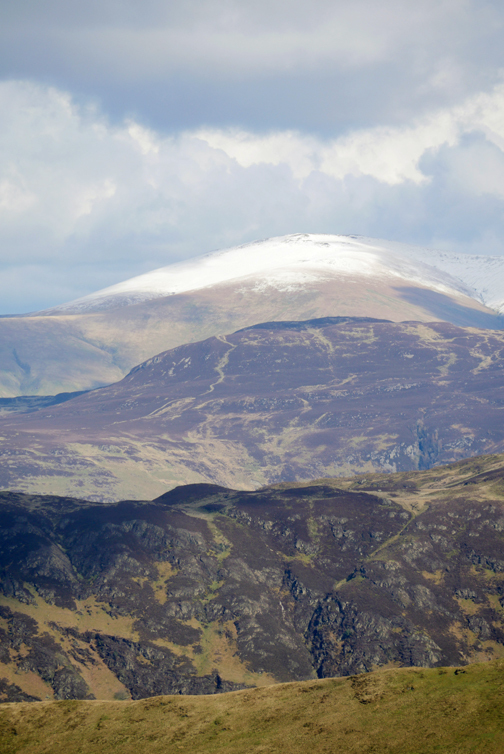 when your eye is drawn to snow on Clough Head. 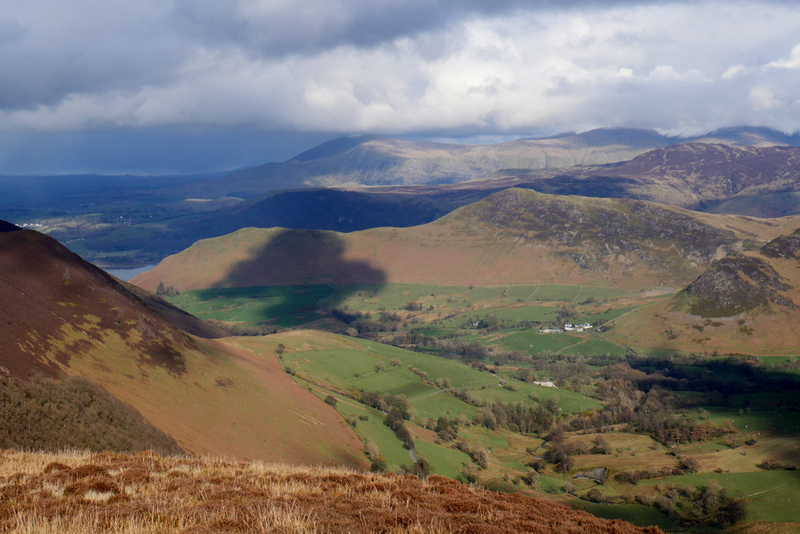 looking across the ridges of Maiden Moor and Bleaberry Fell. 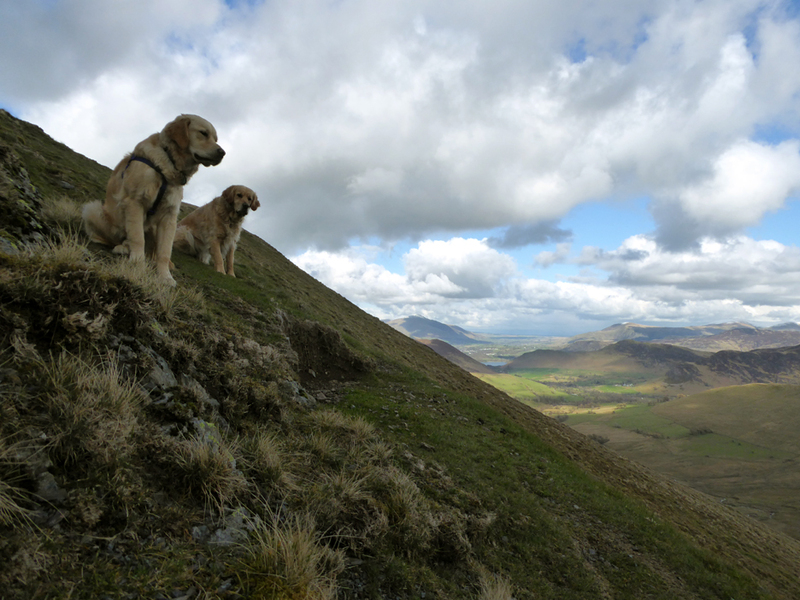 The ridge to the summit is often quite narrow, hardly room for two dogs abreast. Don't worry, the path is off to the side of the crest at this point. 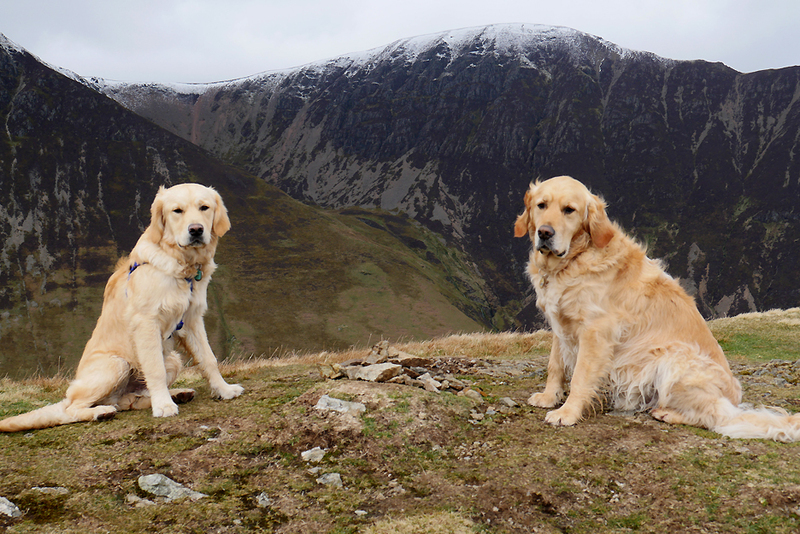 Their attention is drawn to someone or something else, as I move around to catch the snow on Crag Hill behind. 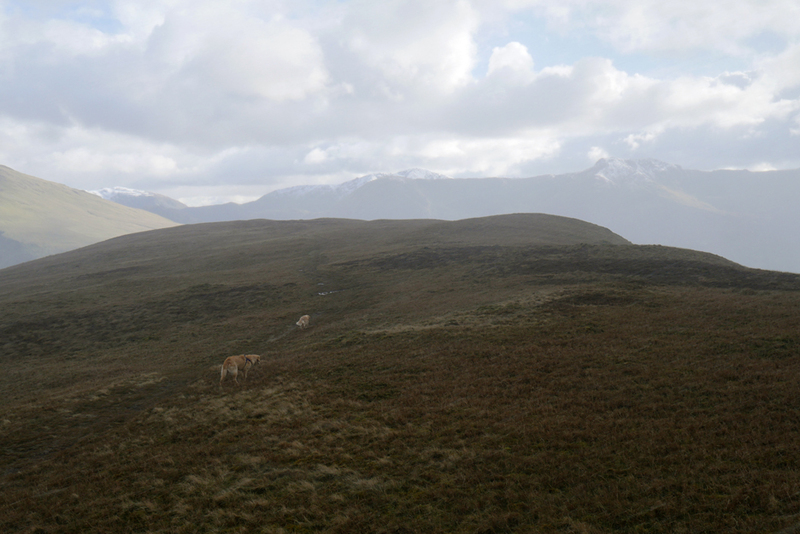 The level, moorland section before the actual summit of Knott Rigg. 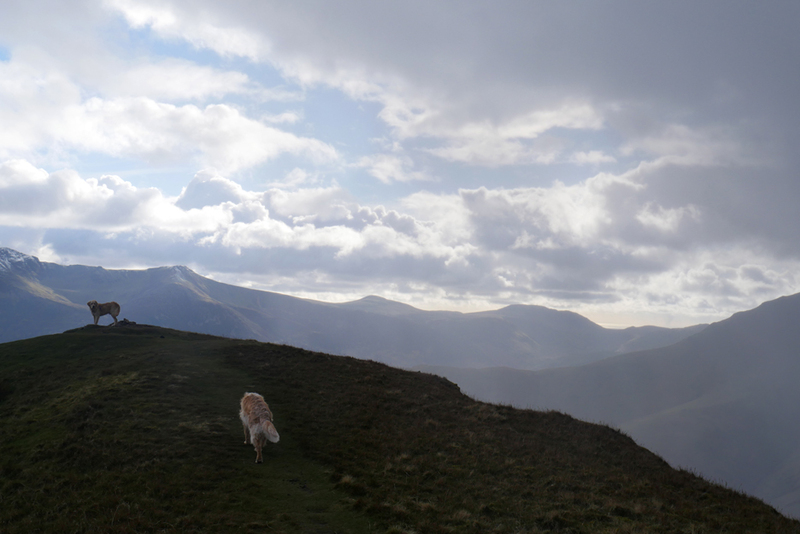 The dogs are running around once again as we get our first view of the undulating ridge of Causey Pike to the right. 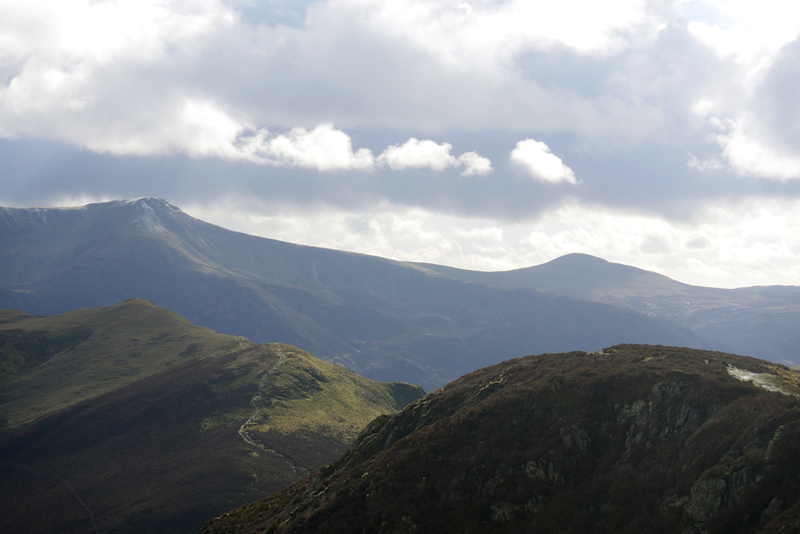 Ard Crag blends into Causey Pike from here, but you can just make it out by its slightly greener colour. Dogs again . . . they are fine but the summit cairn leaves a little bit to be desired. but one forgets that there is nearly a mile distance and a drop of around 250 feet separating the two separate summits. Still . 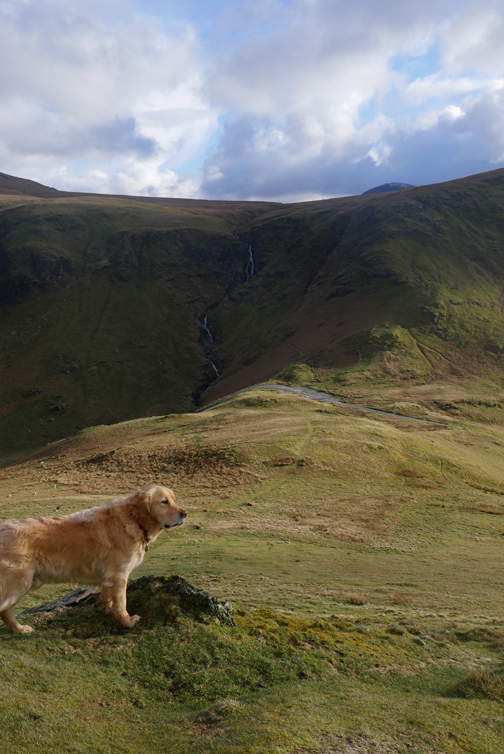 . . there's a superb view as you walk along. 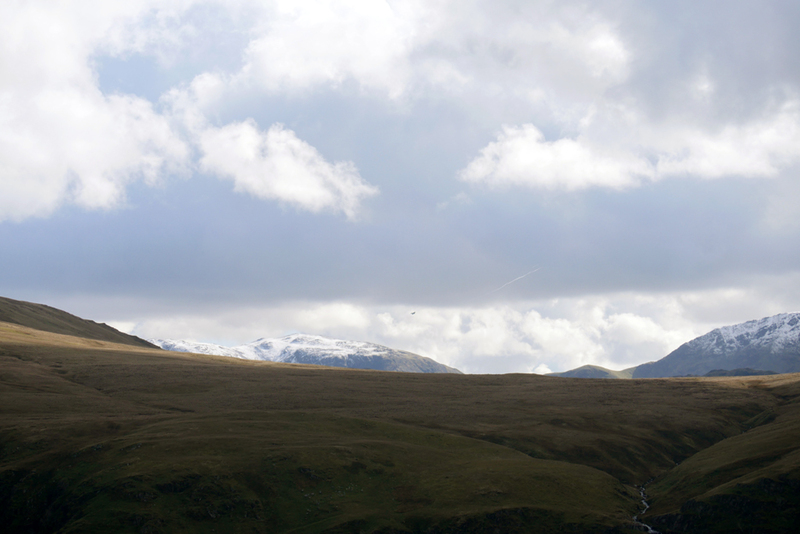 The whole of the northern section of the Helvellyn ridge is on display in its winter mantle. Don't look now but I think we're going to be enveloped in our own winter mantle. Ann stops to put her warm hat on as the bad weather approaches. If you look closely . . . you can still see the mountain behind. The moisture fell as tiny snow crystals, not hail and surprisingly not wet at all. 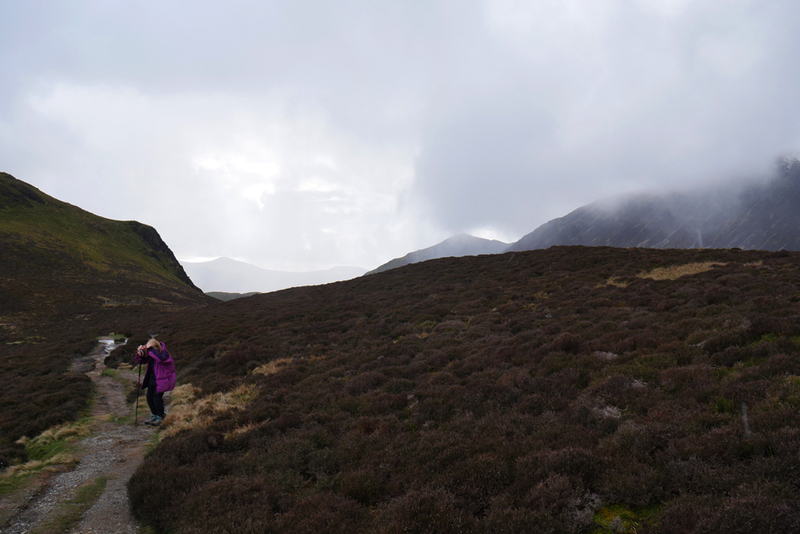 It bounced off our coats and non-waterproof trousers which also remained dry. As quickly as it came, it headed off to the east. Through the clearing shower we can see the white outline of the distant hills once again. 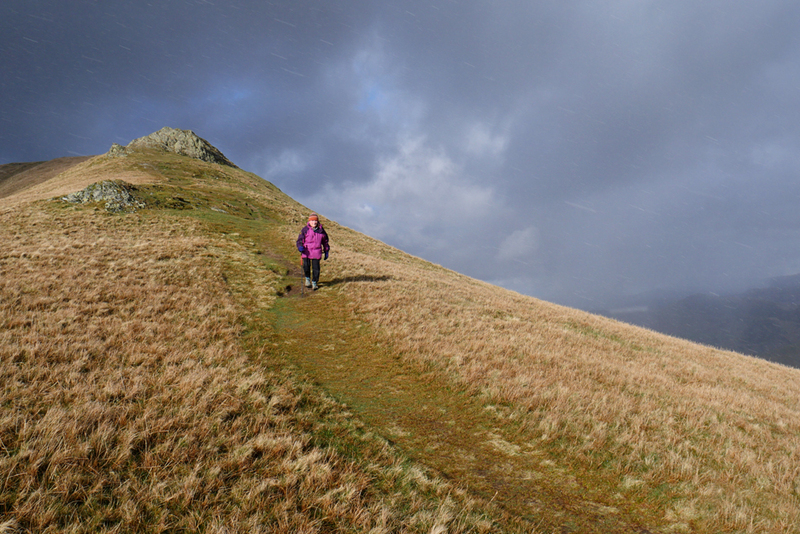 As we reach Ard Crags summit the shower has passed and the sun appears once more. Sunshine after a passing shower . . . we were hoping for a rainbow . . . and if you look closely you can just see it. We sit for a few minutes for the cloud to clear and the full view return. My panorama in the form of a dozen or so stills (joined together at home by technology). Ann's camera took a shorter panorama of the departing shower using the built-in camera programming. 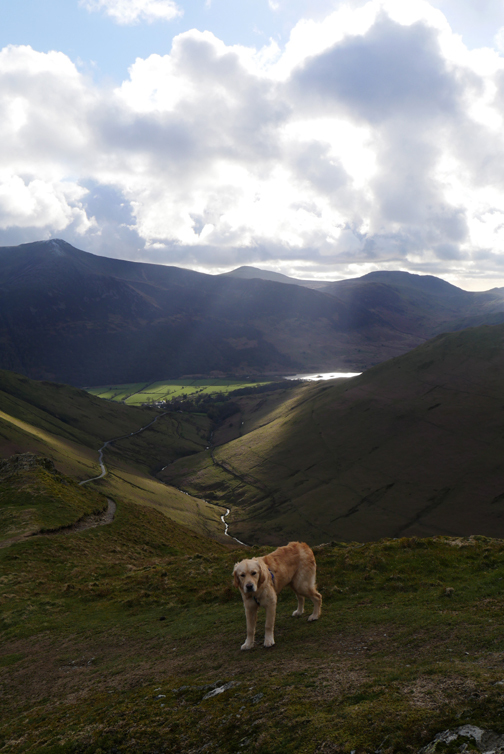 All clear now so "Snoopy the Dog" takes a stroll across the face of Catbells below us. He's not real . . . he's just a shadow of his former self ! Hindscarth and the crags of Dale Head just behind, have a light covering of snow today. In the gap in the distance are the craggy outlines of Harrison Stickle, Pike O'Stickle and Pike O'Blisco in the Langdale Valley. 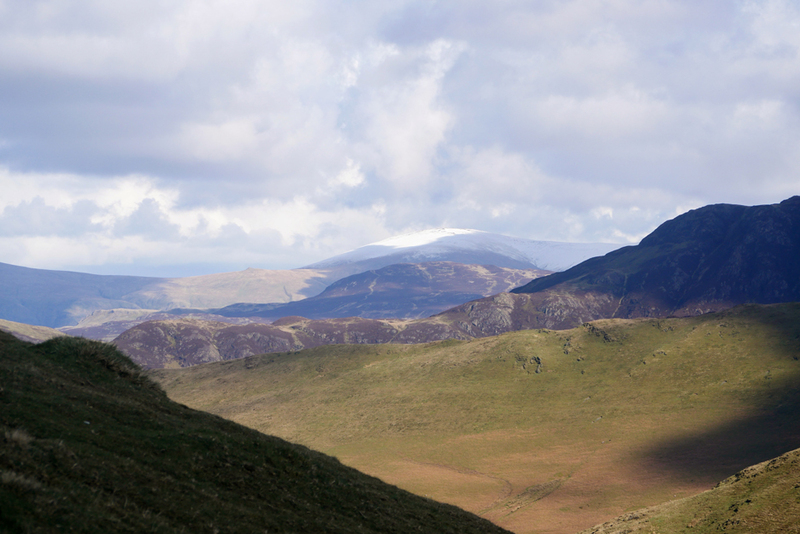 Zooming in on Pillar, the famous rock being hidden behind the summit of High Crag. Again an on-camera panorama from Ann, looking along the same return route as we walked on the way out. 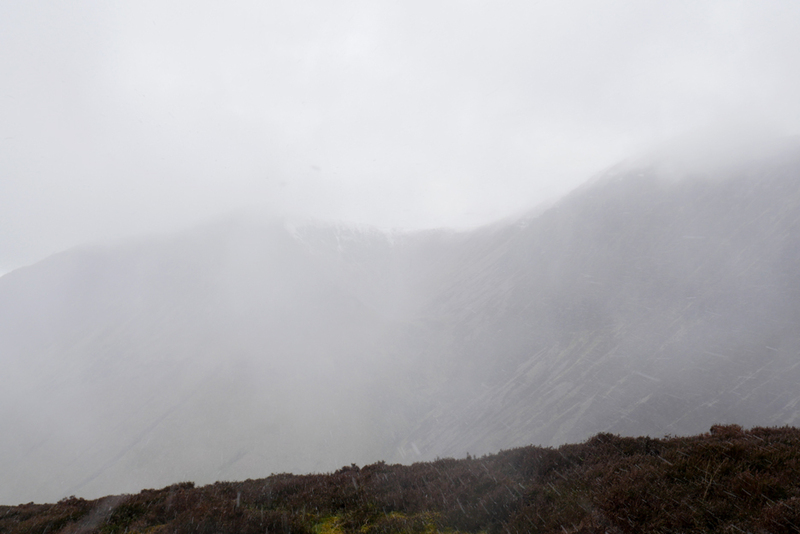 A 'grey and white' Red Pike above Buttermere with the ridge falling gently to Starling Dodd. I was attracted by the white fluffy clouds above, highlighted by the darker clouds behind them. 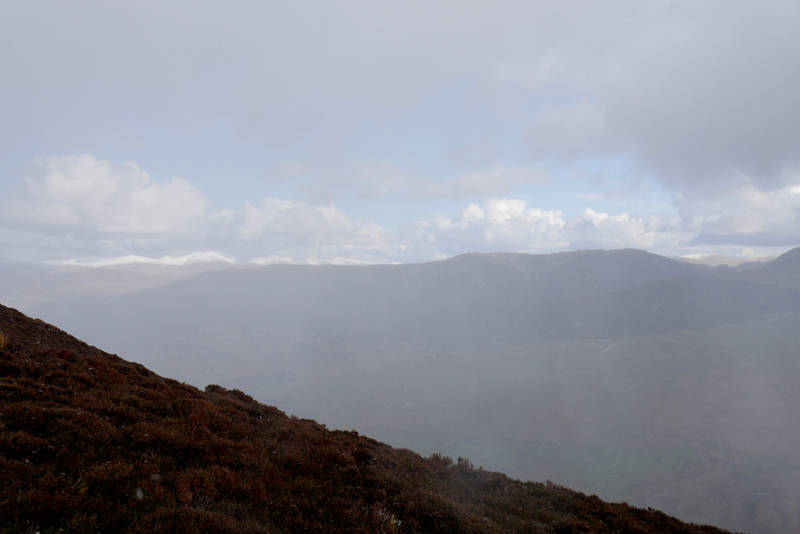 Dylan and Dougal heading back to Knott Rigg cairn as another light shower blows through. 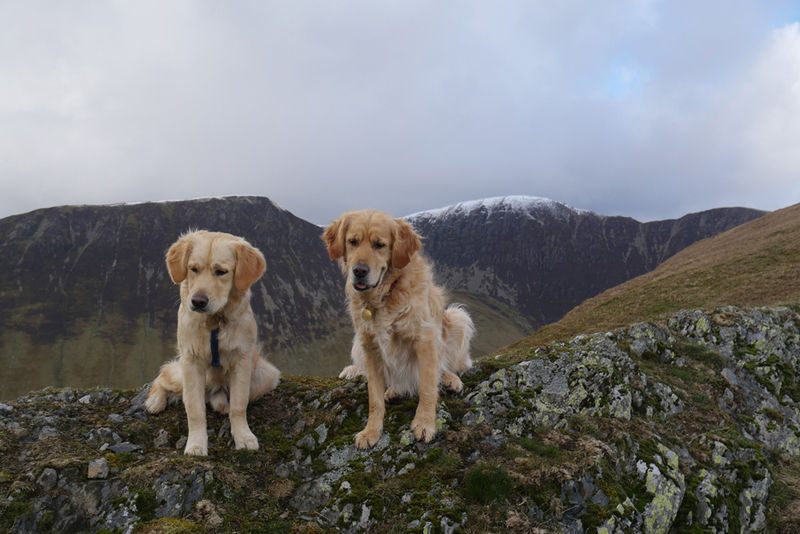 This will be the third summit of the day but it doesn't count as we've done it once already. Back across the high level moorland, darker across the ground as the air has cleared but the higher cloud hasn't. Sunshine now as we head down towards the steep descent. 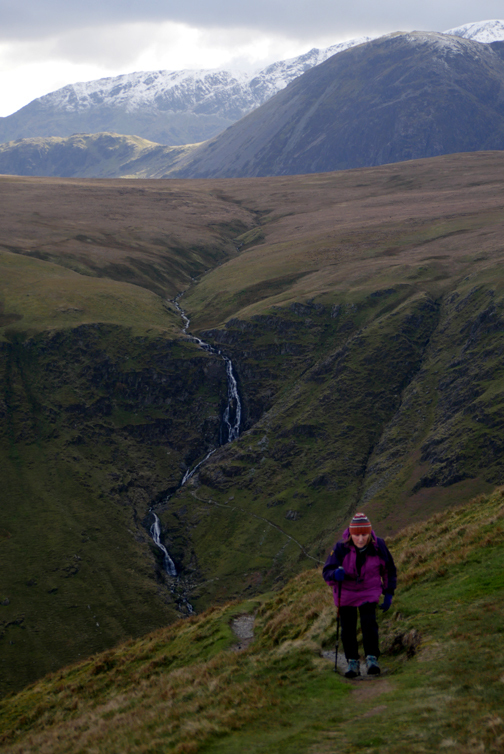 Being out in changeable weather is not always bad, as you do get to see a great variety of colours in the landscape. Ann below the crag in the previous photo. Dougal in the shade . . .
. . . Dylan in the sun just a short while later. 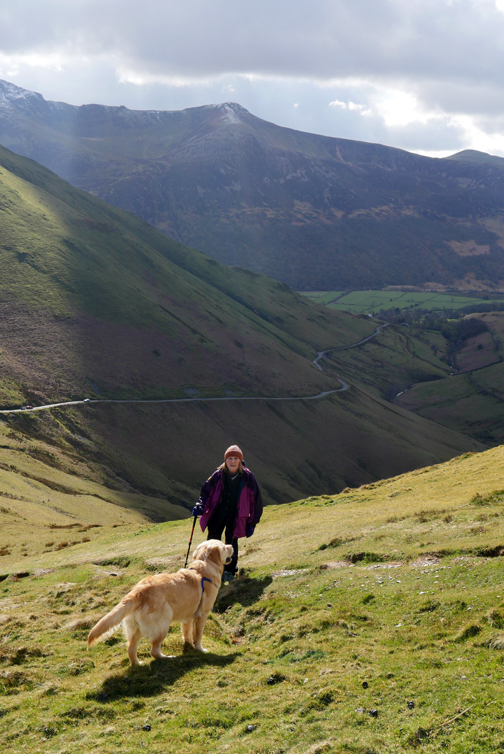 The last short descent and we'll be back down at the Newlands Hause road once more. 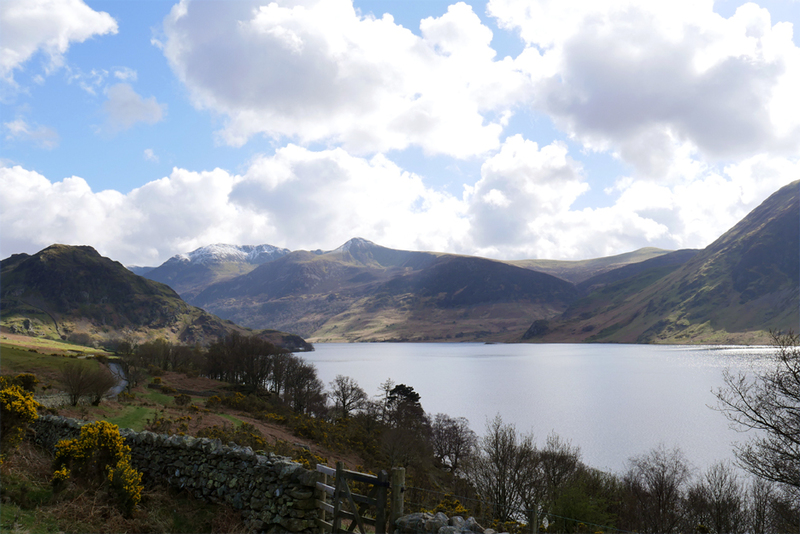 Driving down into Buttermere . 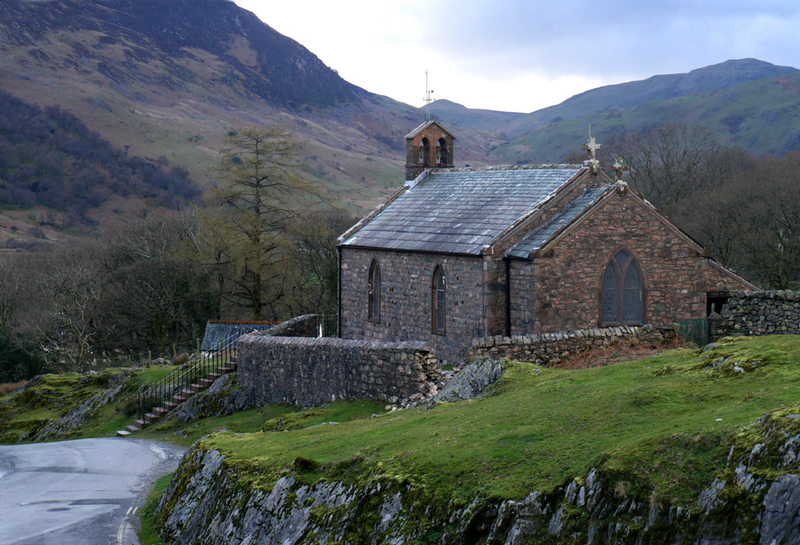 . .
We stop for a photo of the delightful St James's Church . 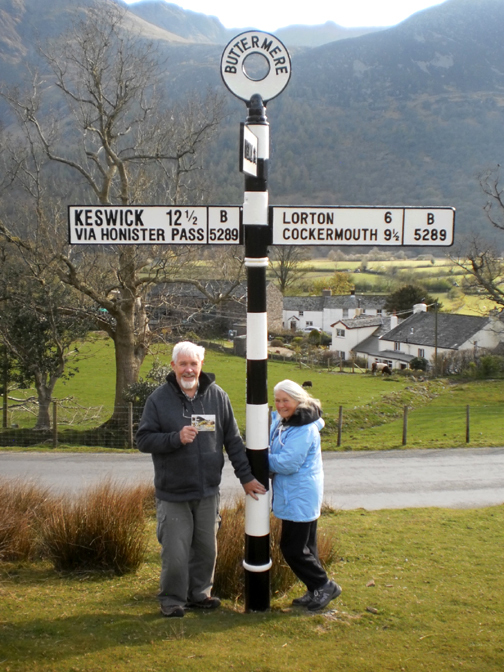 . .
and take a picture of the fully refurbished fingerpost, complete with its third arm once again.
. . . checking out the new look sign. 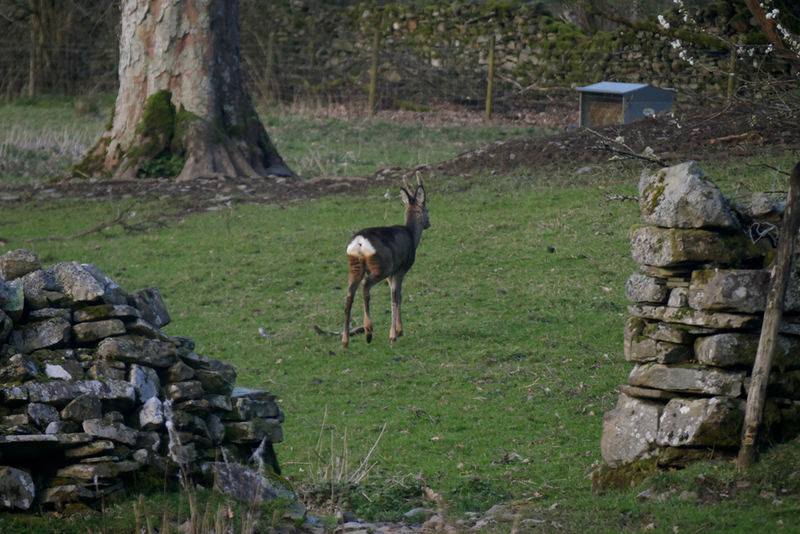 Two final photos to close, from our drive back home via Brackenthwaite. and walked purposely across the field. 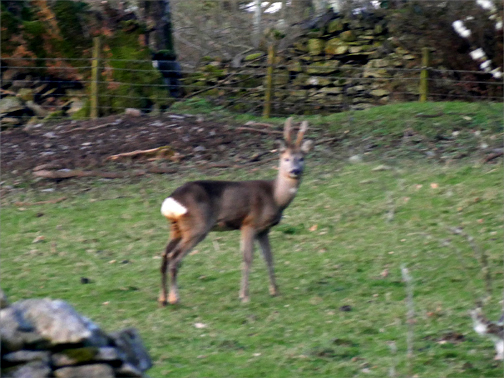 he was already walking away. This site best viewed with . . . fell boots back on the feet.